The Journey is one of Dodge's popular mid-size SUVs. It has the personality and performance to handle any day to day task you throw at it. Our team loves the utility and performance the Journey provides. 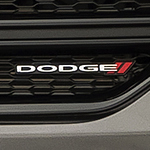 The Dodge Journey has two available drivetrains. A 2.4L 16-valve four-cylinder and the award-winning 3.6L Pentastar V6. The 2.4L is paired with a four-speed automatic transmission that allows it to achieve up to 25 mpg highway. This gives the Journey a range of up to 500 miles on one tank of gas. The Pentastar is offered with a six-speed automatic transmission. The transmission has the AutoStick feature that allows you to select the gears manually if you would like to. The 3.6L will also return up to 500 miles on a single tank of gas. No matter how you chose to option the Journey it is an efficient SUV with ample performance for any situation. Come test drive the Dodge Journey at Mitchell Auto Group.